Being a senior I have heard this question SO MANY TIMES, so, “What’s next for you?” Honestly, I am not sure what’s going to happen. This day and age you have to cross every T and dot every I to make sure you are marketable. Do I want to go to grad school? What school? How am I going to pay for it? Do I want to get a job? I try not to think too much and over-analyze, but then realization sets in- I am going to be walking across that stage in eight months and into the world. I have to admit its nerve wrecking to think what the future holds. So, for now, to all my graduating seniors: stay positive, don’t stress (easier said then done) and enjoy your last two semesters or semester. You have come so far, your professors have prepared you enough with papers, research and projects to set you up for the next step. In the mean time, place your best foot forward and NETWORK…..I have to say this again…NETWORK. I understand it’s a little intimidating to meet professionals and put yourself out there, but this is your chance to set yourself aside from the many other students they have met. Have a firm handshake, smile and dress PROFESSIONAL. Just think you are your own limitation. and YOU CAN DO IT! 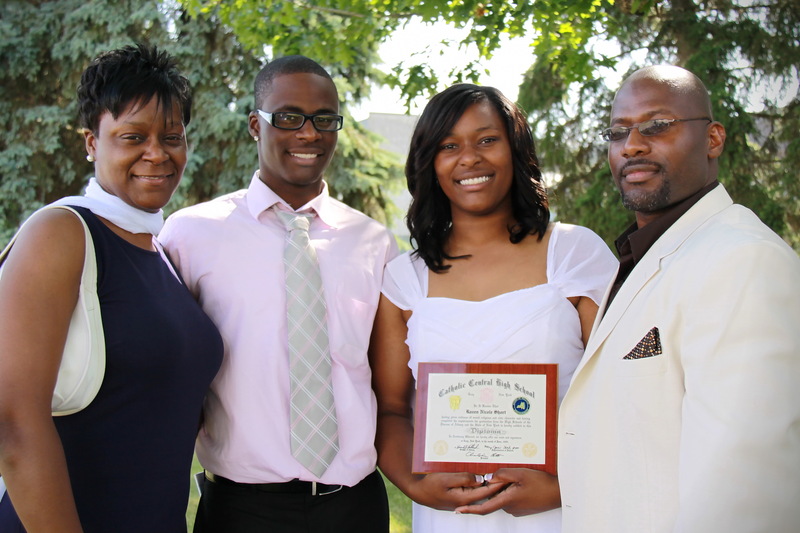 Almost 4 years ago my family helped me celebrate my high graduation. I cant believe in 8 months this will happen again. Where does the time go?